Hurrah! I have finished my donation for the Harvest Halter Live Show in September. 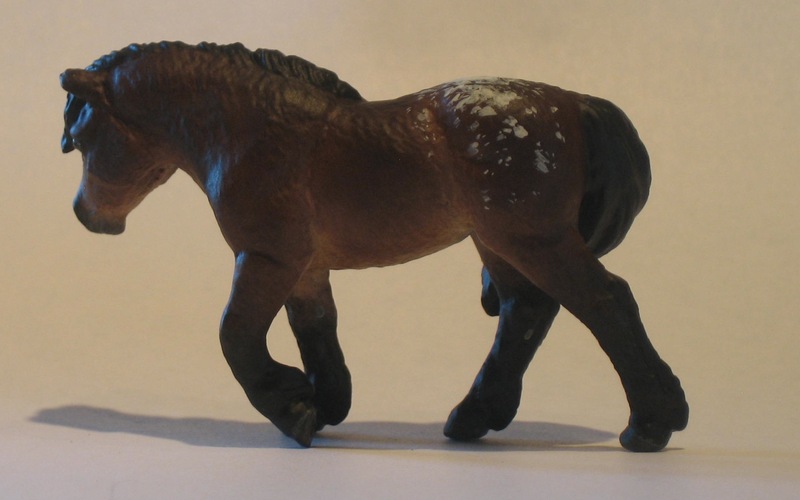 This is Cornucopia, a Safari Toob pony in bay appaloosa. I’m going to show her in early September (as a POA/Shetland cross) and then she’ll be a raffle model at the Sept. 22 show. 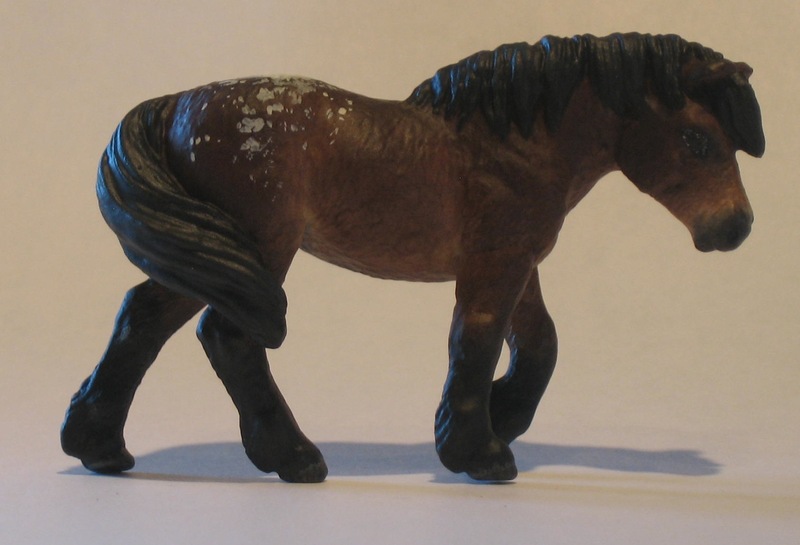 I am working on a donation for the earlier show as well- another pony. 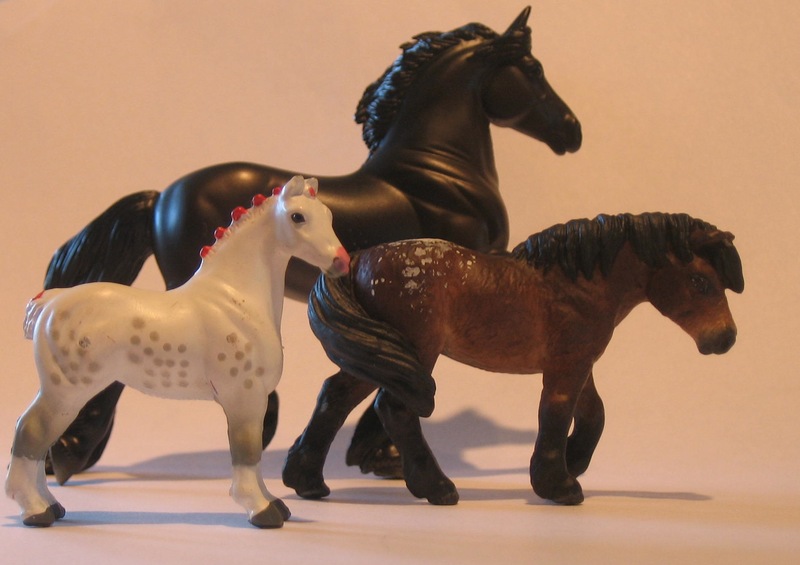 I think I have a pony problem… luckily these two are headed immediately for new homes! This poor guy has been 99% finished for over a week but now he’s finally done and ready to go home. He is my second commission, and was just a blast to paint. I’ve been calling him “Martin’s Appy” in my notes, but I have faith that his new owner will give him a more suitable moniker. Since I had a couple roans and appaloosas coming up I decided to head down to Blick’s Art Supply and finally get one of the teeny brushes recommended by the amazing artist Jamie Baker. Jamie does the most fabulous roaning, even in Stablemate scales. But being me, when I got to the store and found the brush (Escoda Optimo Kolinsky Sable Reservoir Liner, Series 1310, size 2) I couldn’t help but price it against other similar brushes. And when I found one half the price that looked just as nice and small, I bought that instead. At $10, it’s my most expensive single brush. My new brush is the Winsor & Newton Sceptre Gold II, Series 101, size 00. 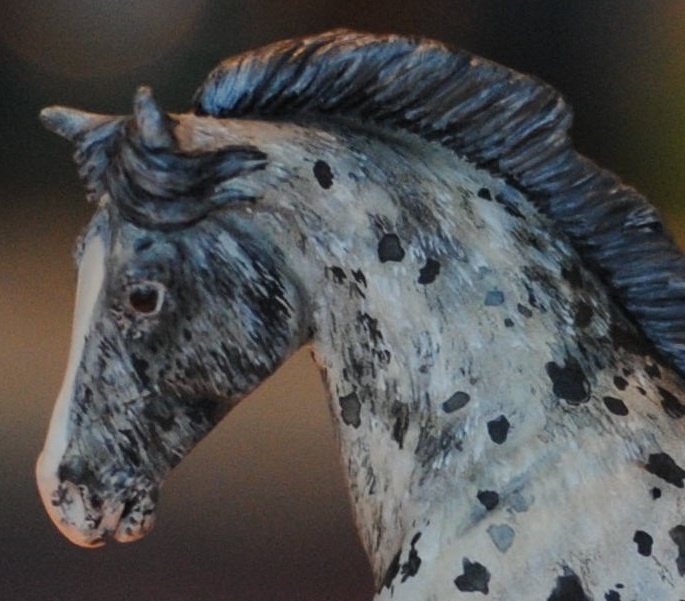 I’ve been using it on this roaning leopard appaloosa, and I really like how well it works for hair details. Of course, perhaps the Kolinsky brush is better- maybe even twice as well. But I’m too much of a cheapskate to find out. Maybe when this one retires I’ll spring for it. Who knows? 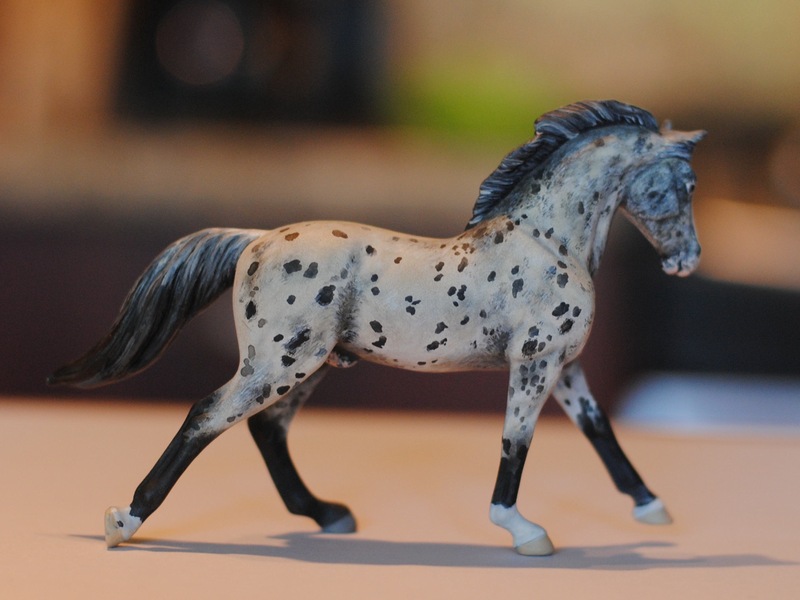 This guy still needs marking and hooves done, and looking at these pictures I see a couple other things to work on. But I’d say he’s 95% finished! 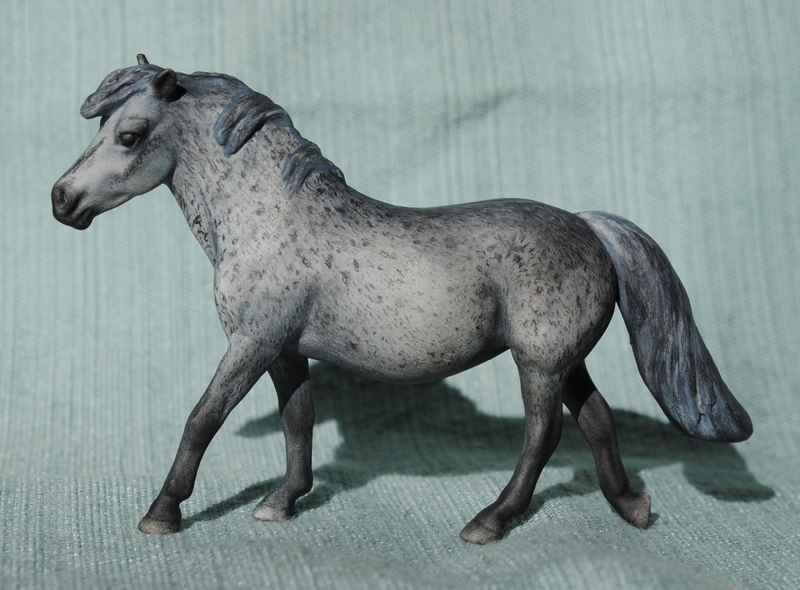 It was really nice to be working predominantly in acrylics, as I am on this appy and on Sleipnir, since I only have to wait for the paint to dry instead of the hour plus I have to wait after putting fixative over a pastel layer. When I have the time to devote, it’s nice to get so much done in one sitting. 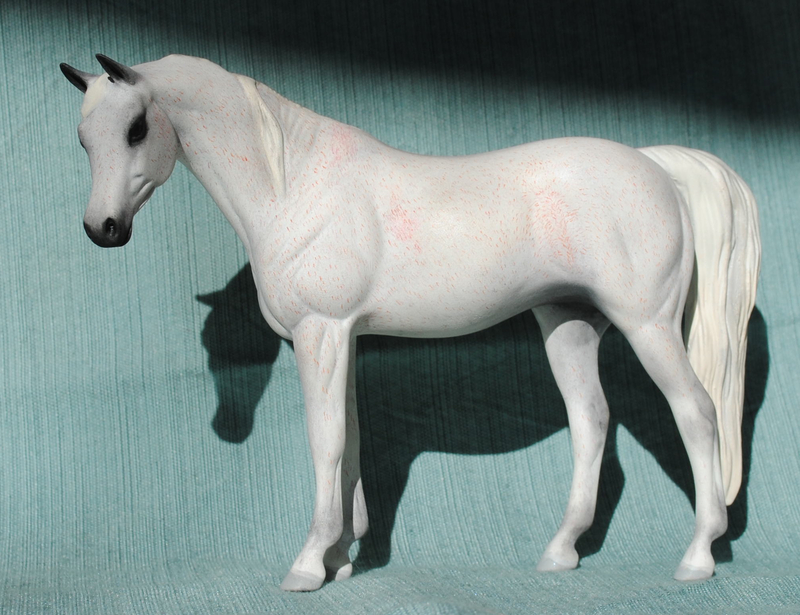 In fact, Sleipnir is officially finished… pictures coming soon. I finally got some paint out yesterday and put some color on two of my prepped horses. It was really fun to have a brush in hand again! This spotty fellow is a commission/trade. He is an absolute blast to paint. Here he has one layer in acrylics and one in black pastel. 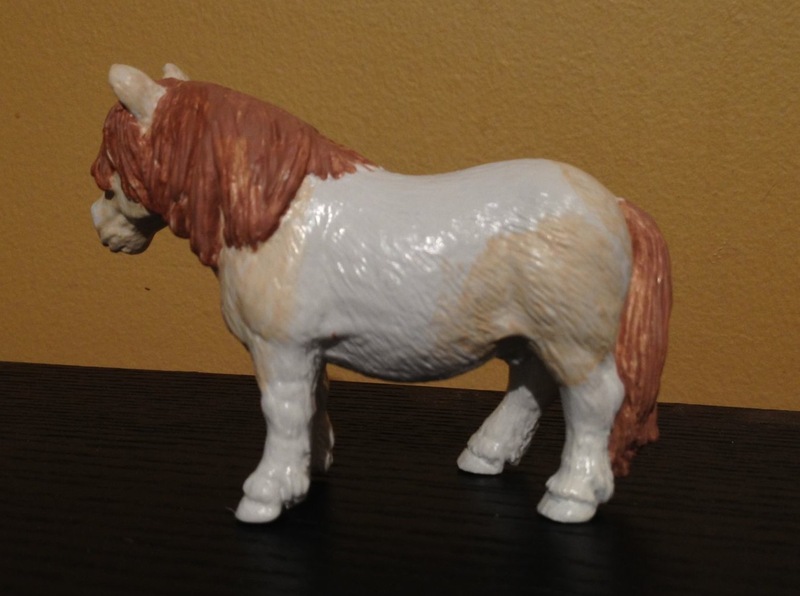 Next I’ll start working on making his white a more realistic off-white horse color instead of the stark hue of the primer. That will dull down and “push back” a lot of the spots and roaning I’ve put on in the first layer, but hopefully that will give a nice depth to his color. And I’ll go back in nearer the end and darken the spots and reroan as desired. Working on his little hairs makes me really eager for my upcoming strawberry roan. This guy is looking a little scary at the moment, but that strange mane and tail was just to give me something to see instead of white as I paint his body color in. 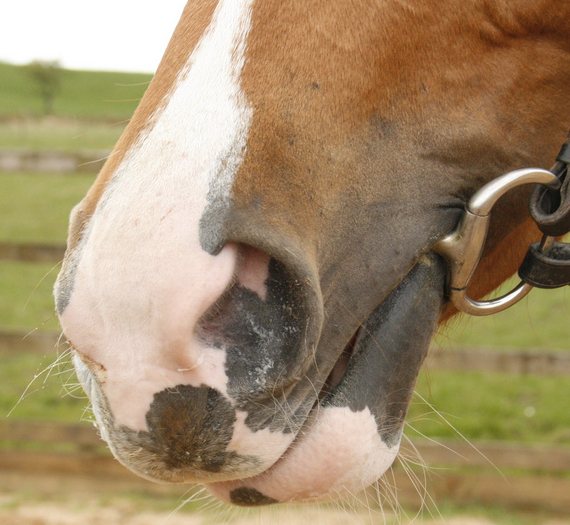 Many people, myself included, will do a pinto by finishing a complete solid paint job and then layering the white markings over. 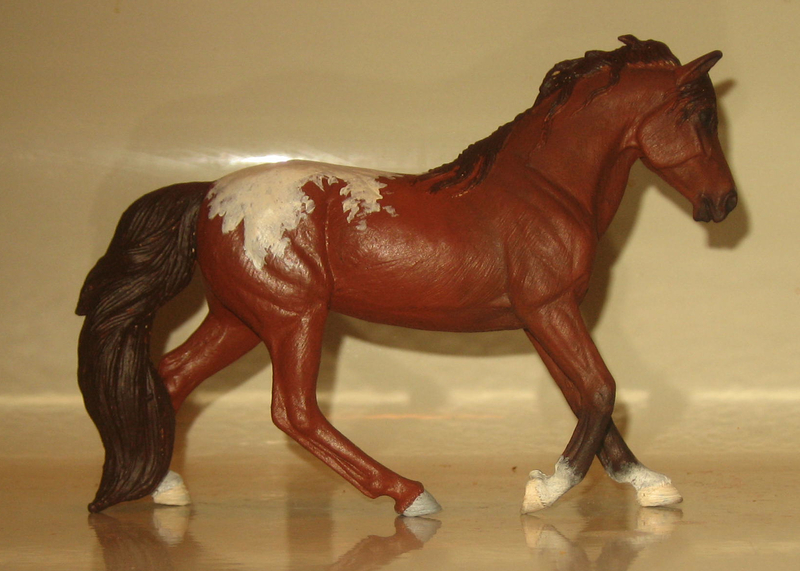 In this case, because the horse has so much white (his other side is nearly completely white) I’m only pastelling the chestnut color into the specific places I marked out in acrylic. That way I won’t be wasting time, energy, or materials on a bunch of coloring and shading that will just be painted over. I used a really light layer of a base color to mark the spots (it’s much lighter in person) so that it will barely influence the final color more than plain white. 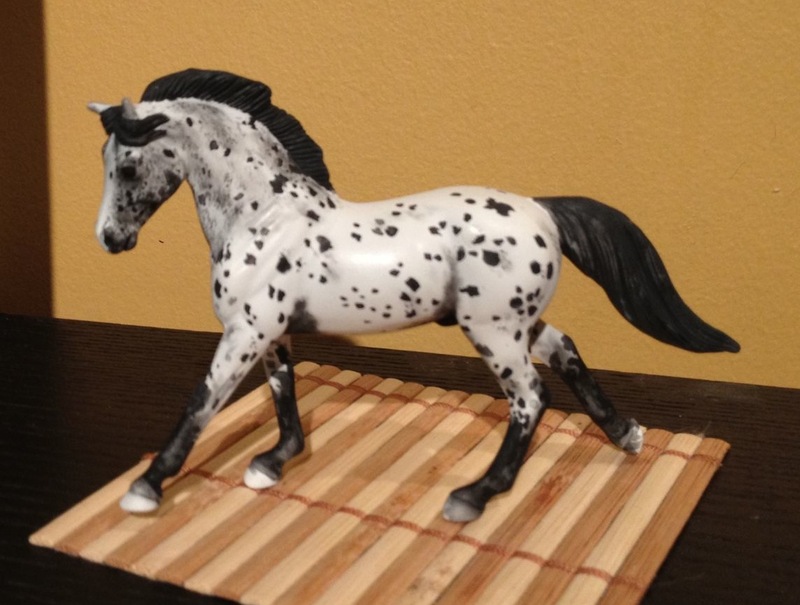 After the spots are their finished color, I’ll redo his white in a nice off white horse color and add the appropriate shading. I hope he’ll end up as cute as my reference pictures! 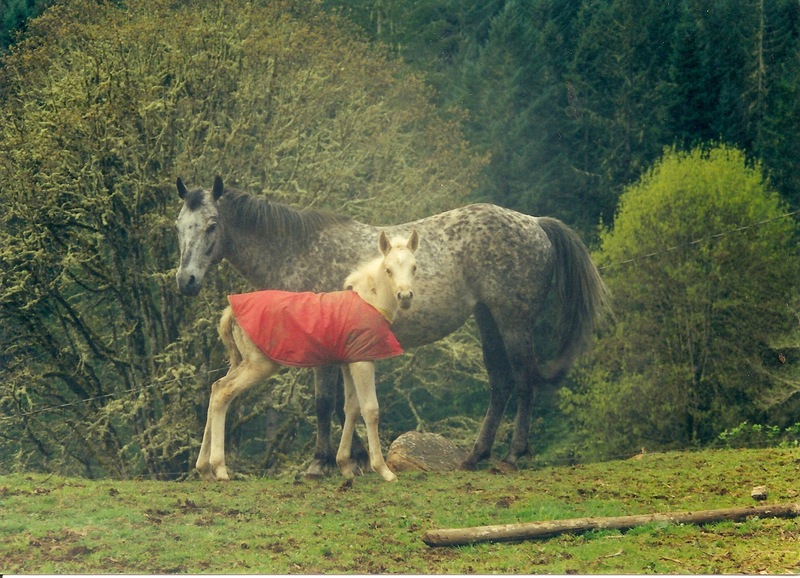 I was tickled to find, while browsing for appaloosa reference pictures, that apparently there are appaloosa Gypsy Horses. As a draft horse fan, I am seriously drooling. 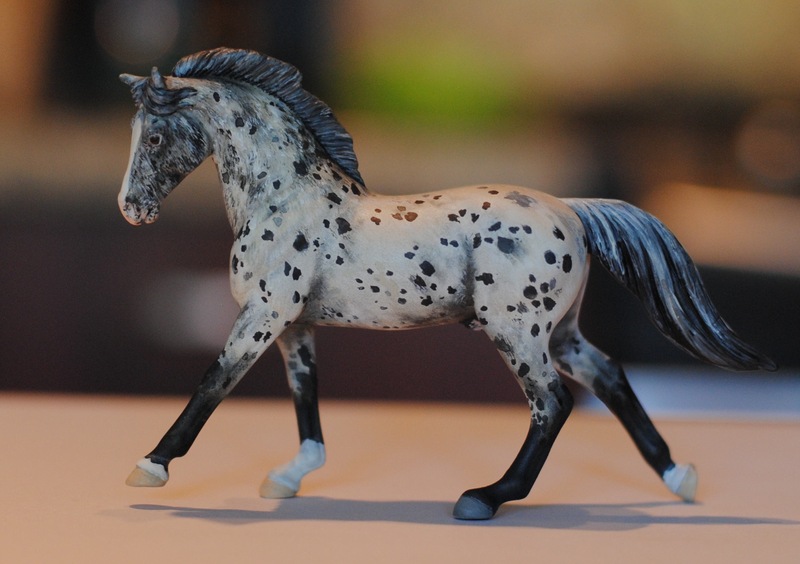 I also ran into a fun blog for model horse hobbyists, called Check Out This Horse! It’s basically a daily digest of interesting-colored horses for sale. Some of the pictures are too small for good references and it’s a little heavy on champagnes, but definitely a fun site with some cool and inspiring pictures.